Katharine Yeaton is one of our Equine Specialists, certified in EAGALA, at Heron Hill. Her passion for horses began as a child. She owned and operated a horse farm in Virginia for ten years before returning to Oregon in 2010. She pursued her degree and certification in the Drug and Alcohol Counseling field; she is a certified CADC 1, as well as a Peer Recovery Mentor. She developed the “Ride with Pride” program at Hampton University in 2008, for first generation college bound females ages 12-13. While living on the Eastern Shore of Virginia, she owned and operated a tack shop and a blueberry farm. 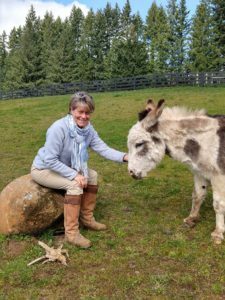 She has over 30+ years of direct hands on experience with horses; and over two decades personal experience in the recovery community.